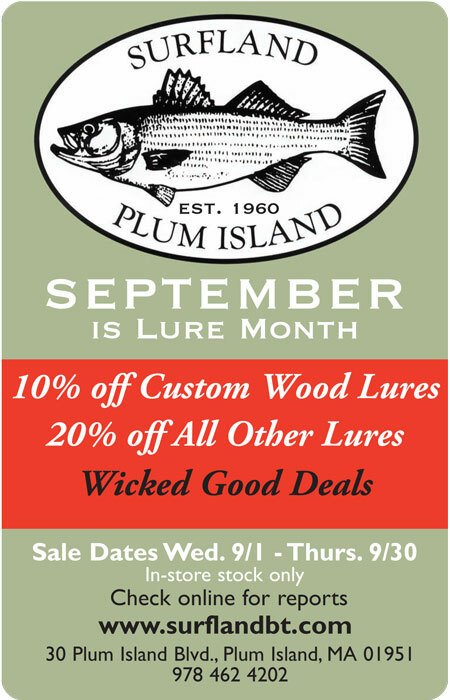 Surfland Bait and Tackle – Plum Island Fishing » September 8, Land Ho! 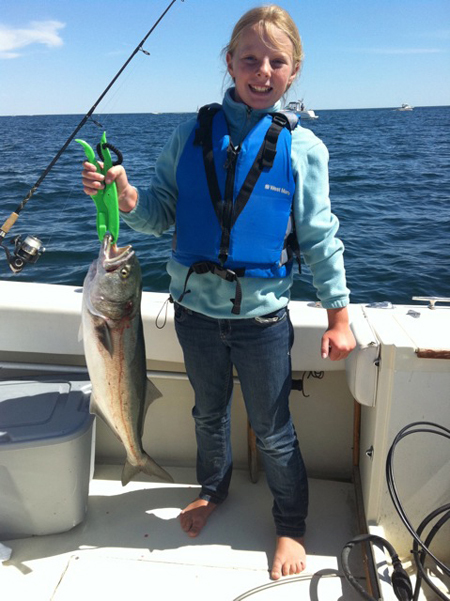 Bluefish finally hit the beach Tuesday. “John the Dentist” called in a report from the refuge saying that he caught some in the afternoon using metal. Hopkins, Kastmasters, Charlie Graves, and anything shiny was working. They arrived early in the afternoon, which would have been the “outgoing”. Let’s hope they do it again today! JUST IN… Well today is turning out to be a good one. 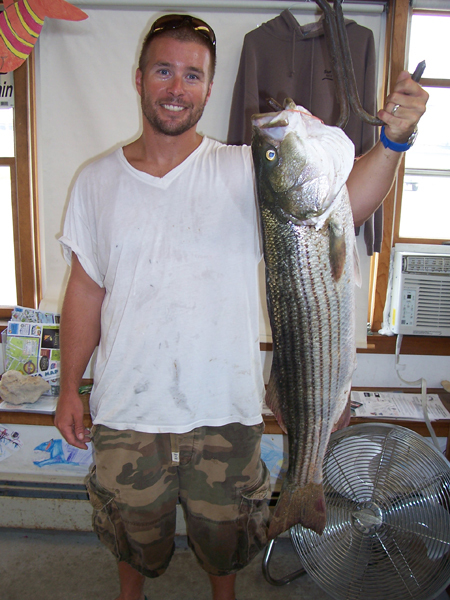 Doug Henderson from North Andover was just in to weigh in this 16.13 lb striper he caught this morning down the refuge using BLOODWORMS! 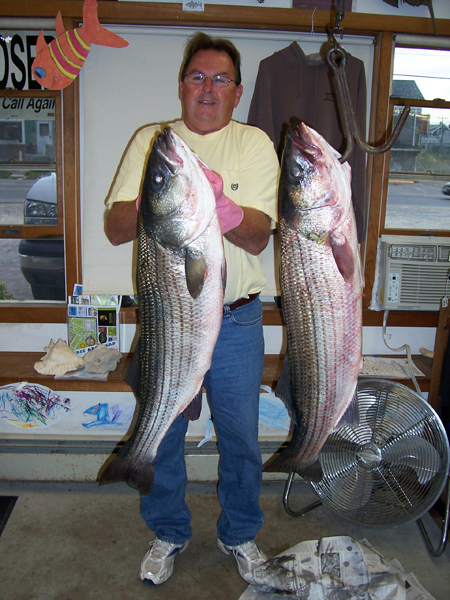 During the incoming tide about 8am Doug landed two “keepers”. One was put back the other is going home for dinner. The only comment Doug said was that he had to get the bait “way out” before he got anything to bite! The McCoy’s have what it takes. 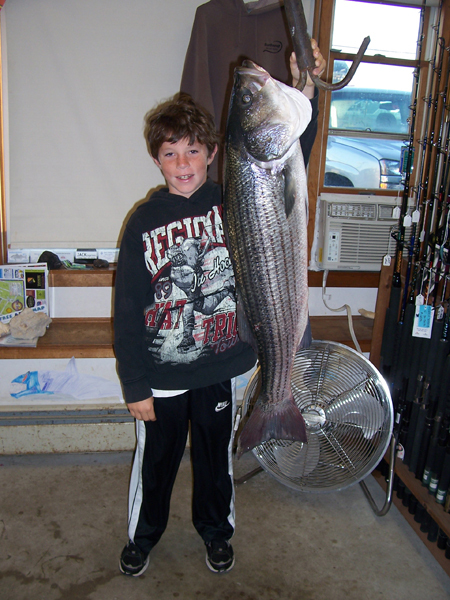 On September 6th ,while fishing with his uncle PJ McCoy from a boat, Hunter McCoy landed this 22.4 lb striper using a live eel inside the river. Uncle PJ also brought in a 21.1 lb bass also caught on live eels but must have been camera shy. This time along the oceanfront……………………..PJ, his brother Donny, and his nephew Dominic (a SBT employee)were out fishing along the oceanfront, again using live eels and found fish. They seemed to be at different spots along the oceanfront. But, that is to be expected this time of year. Don’t forget our lure sale this month. With all the fish out there you’ll need to be replacing gear too. All have beautiful fish. Great job. Got to get out of the office and catch a few. Incoming worked this afternoon for a little while – 24, 25,& 26in within a few minutes of one another, two on bloodworms, one on clams – after that nothing.